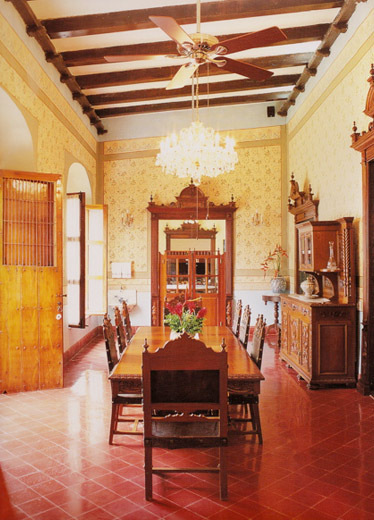 and timeless appeal of Mexico’s old-world country estates. From high-beamed ceilings and cool tiled floors to the use of decorative wrought-iron and carved-stone, today’s haciendas intermingle the soulful antiquity of Mexican antiques and country objects with contemporary art and comfort. As hacienda interiors were often minimally furnished, rich color, patterned concrete floor tile, wainscots and stenciling were favored design elements to decorate grand-scale spaces. See our Hacienda Color page to view our new Hacienda Style Color Palette with Pittsburgh® Paints.